Arrow is a young woman and a sharpshooter. Kenan is husband to Amila; father to two daughters Aida and Sanja, and son Mak; and neighbour to Mrs. Ristovski. Dragan is middle aged, alone. His wife Raza and their 18-year-old son have escaped the madness that enveloped Sarajevo when the Serbian forces laid a siege around the city between 1992 and 1996 – the longest siege in the history of modern warfare. 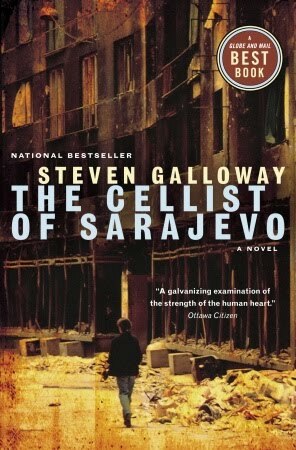 Steven Galloway’s The Cellist of Sarajevo is the story of Arrow, Kenan and Dragan as they come to terms with the reality of a war ravaged city that they have lived all their lives. The novel narrates the different ways in which these three civilians come to terms with their radically altered circumstances during the siege. To Galloway’s credit, nowhere in the novel does he ever mention the siege from a macro perspective – Serbian forces that surrounded the outlying hills of Sarajevo are never named, and neither are the Bosnian government defense forces named. The novel shows there isn’t too much to choose between the attackers and the defenders, and depicts the daily trauma of living in the city that is changing forever, its inhabitants slowly wilting, decaying, and disintegrating. Arrow, the reluctant sniper, who is tasked with protecting the cellist who decides to play his cello for 22 days to commemorate the death by mortar shelling of 22 people who had lined up to buy bread, regrets Sarajevo’s transformation. The three characters in Galloway’s novel seem to derive inspiration from the cellist and resist the all-pervading sense of gloom that has engulfed the city. Dragan, caught in a sniper crossfire that hits Emina, an acquaintance, and kills a stranger. “Was being killed really better than being wounded? He isn’t so sure now. The idea of knowing the moment of your death is imminent no longer seem so bad compared with an instantaneous ending. Emina will survive, of this he feels confident, but if she didn’t, if she were more seriously wounded, wouldn’t it be better to get one last look at the world, even a grey and spoiled vision, than to plunge without warning into darkness? Then later, he realizes that giving up would mean defeat. The significance of the novel is that what happened to Sarajevo can and does happen to other cities quite suddenly, and there is no way to predict and prevent it. When people are filled with hatred – often for who they are or what they have become – they always look for and find the other. In destroying the other, they destroy themselves.